BOWLZILLA Gold Coast beat back the storms on the weekend so skateboarding could stand triumphant. 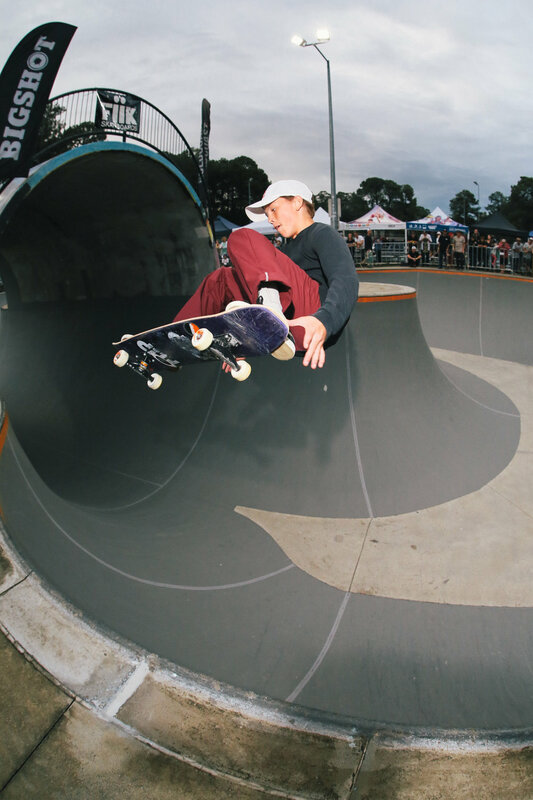 The ASF National Park Skating Championships were successfully run in all divisions at the largest skateboard competition in Australia for 2019. The entry numbers were up again this year and more interstate and international friends and competitors flew in to the Gold Coast for the fourth year of BOWLZILLA Gold Coast and its first year as the ASF National Park Skating Championships. Every single one of them wanted nothing less than a full running of the competition to not only have their shot but support and cheer on their mates. Skateboarding is more about community than the individual win and that was well and truly on display all week. Yeah Girl worked with BOWLZILLA again to ensure the highest paid Equality-in-Skateboarding event in Australia for the second year running. The growing interest in skating in the Olympics is all well and good but wider community benefits away from the rings is where the real benefits are being seen from this new platform for skateboarding. Councillor McDonald and Gold Coast City Council saw their investment pay dividends for the local community this year in exceptional ways with more out of state and international visitors and competitors. The local benefits of BOWLZILLA Gold Coast are now being banked on each year as an annual occurrence by the local community and the skaters are being welcomed in to experience more of the awesome Gold Coast lifestyle with many repeating the same thing – we ay not go home from this event next year. Tourism & Events Queensland support in helping amplify the fantastic contributions skateboarding makes to the Gold Coast and Queensland are raising wider awareness, interest and audience which is having a snowball effect on all parts of BOWLZILLA Gold Coast. Inclusion of BOWLZILLA on the It’s Live! in Queensland events calendar had more people turning up to all of the events this year. This year’s BOWLZILLA Gold Coast festival had larger attendance across all events and more sponsors helping make everyone happy. The week started with a Women’s learn to ride clinic, then a welcoming party with video part premieres by Shaun Boucher and Zane Hetherington at Beach Burrito Company, the comp ran Saturday event though there was torrential rain which meant only the Open and Women’s divisions could run, Dive In the official after party at Beach Burrito company was full but not the wild affair it was supposed to be as everyone was back to the park on Sunday morning for the 16 & Unders and the Pabst Masters divisions. “The community spirit in skateboarding is one of the most rewarding parts of all of this. There was no better display of it than this weekend. We had bigger spectator numbers from the beginning of the day and as soon as the rain turned up, they settled in. They stayed and willed the clouds to part. When we decided to call it, they insisted we hold on and half an hour later we managed to get the Open and Women’s divisions done and then many of them came back early the next day to support the 16 & Unders and the Masters. What the Gold Coast and the skate community provide each year for us will always make us proud at BOWLZILLA and always bring us back to the Gold Coast. Thank you everyone and see you next year!” Chad Ford; BOWLZILLA – Director. Sponsors and prize givers for BOWLZILLA Gold Coast 2019 were: Councillor Daphne McDonald, Gold Coast City Council, Tourism & Events Queensland, Red Bull, Pabst Blue Ribbon Beer, One Shot Drinks, Fiik Skateboards, Yeah Girl Skateboarding, Gold Coast Skateboard Coaching, Beach Burrito Company, Goliath Distribution, Boost Mobile, John Mills, Truck Stop Skate Shop and ASF. Posted on March 19, 2019 by BOWLZILLA. Wellington City Council, Redhead or Dead Events, Skateboarding New Zealand and Miryoku Agency raised the Capital with the New Zealand 2019 National Park / Bowl Skating Championships with BOWLZILLA Wellington. SBNZ made sure the New Zealand National Skateboarding Park / Bowl competition series was the best run, attended and most unexpected fun so far. The level of all parts of the festival were raised higher this year with great success. Weather is always a factor in Wellington but nothing gets in the way of a determined skater. With the rain finally coming down after three months of unprecedented sun in Wellington and only allowing Open heats to be run at the bowl a quick decision had to be made. Manky Chops Gallery generously offered their awesome new mini ramp that was built for Manky Deck-Aid to be utilised to its fullest, and MINIZILLA was born. The Women, Masters and 16 & Unders all finished out the event riding indoors with a format change that proved incredibly fun and popular. Manky Chops and BOWLZILLA have a fantastic partnership going back many years which is focused around ARTZILLA every year as part of the BOWLZILLA Wellington festival. This year the Manky Chops team went above and beyond with their ten-year anniversary show; Deck-Aid, which saw 100 skateboard decks painted and sculpted by as many artists especially for the exhibition, with a huge part of the proceeds going to several worthy charities. As part of this they also custom built a mini ramp which ended up saving the day and elevating the fun and comradery to unexpected levels. Congratulations Dave, Pearl and the family for all you’ve achieved and give back. Thanks to Yeah Gnar this is the second year of BOWLZILLA Wellington being the largest Equality in Skateboarding event in New Zealand. This support has really seen the talent in the Women’s division develop exponentially. Regardless of the Olympics and whatever else lay ahead, the emerging Women’s skateboard scene is having the most positive impact on skateboarding in a long time. The fact that it is part of the whole of BOWLZILLA Wellington makes the festival that much more fun and important for the community. The New Zealand National Champions for 2019 are; Women – Rhya Henare, 16 & Under – Rimus Henare, Pabst Masters – Steve Crump, Open – Shaun Boucher. The interest in skateboarding is growing and that could clearly be seen by the doubling of competitors in the 16 & Unders, and larger fields for the other divisions. Pabst Blue Ribbon beer generously stepped up this year to support the Pabst Masters division and all the other sponsors and encouragers ensured a larger level of support for all the skaters and should all be thanked for the generosity: Wellington City Council, Skateboarding NZ, Manual Magazine, Pabst Blue Ribbon Beer, Fusion Surf / Skate, Skullcandy, Irrom Distribution, GoPro, Vans, Manky Chops, Red Bull, Redhead Or Dead Events and Miryoku Agency. Because of all of them there was NZ$12,000 in prize money and more than $2000 worth of prizes. Every competitor was over the moon to be able to benefit from the biggest prize pool in New Zealand. “BOWLZILLA upheld its reputation of pulling a great crowd of spectators and skaters committed to having fun, in spite of the tumultuous Wellington weather this weekend! Kudos to the community for their versatility and perseverance – the future of New Zealand Skateboarding looks Bright!” Ramon Thackwell – Director, SBNZ. There was a much larger attendance of internationals this year which really raised the excitement and energy of the locals. Jakob Robinson, Jett De Haan, Brodie Jarret, Brent Muscat, Taniah Myers, Paula Costales, Kevin Moran, Tony Chavez, Nic Couscouris, Zane Hetherington, Dax De Haan and Skateboarding Hall of Fame inductee Eddie Elguera who is considered one of the greatest skateboarders of all time and Tony Hawk’s major influence. "The fourth year of BOWLZILLA Wellington saw us able to offer greater support to the skaters and generate more interest and opportunity. The newly energised SBNZ board is a real game changer for what we are now able to do for our community and that was reflected in the new support from sponsors and larger attendance. Wellington is one the greatest little cities in the world and being able to work with Wellington City Council in the ways we do to create a festival like BOWLZILLA Wellington which has such great community impact is what encourages us to keep the forward motion. We’re very grateful and humbled for everyone’s support and look forward to many more years of great times for all.” Chad Ford – Director, BOWLZILLA Wellington. Stay tuned for announcements about BOWLZILLA Wellington 2020. Posted on March 13, 2019 by BOWLZILLA and tagged BOWLZILLA bowlzilla wellington Bowman Hansen eddie elguera Shaun Boucher Wellington bowl skating pool skating pool coping skateboarding new zealand sbnz sean goff taniah meyers niwa shwery rhya henare frontside rock manky chops. BOWLZILLA Wellington Festival is on next week, making Wellington the Capital of Fun! Wellington City Council, Redhead or Dead Events, SBNZ and Miryoku Agency are getting the town shaking. The annual National skateboard festival BOWLZILLA Wellington is returning for its fourth year with the highlight being the all-encompassing New Zealand National Park / Bowl Skating Titles. SBNZ the National Governing body of skateboarding in NZ, sanctions this event as the National Championships for Park / Bowl skating which sees skaters from all around the country, expats and international friends flying in to have a craic. The week kicks off with the Fusion Surf/Skate Welcome Party at The Cambridge Hotel on the 7th from 9pm. There are some drink specials to get everyone happy and DJ Baben kicking of the celebrations with fine tunes. It’s free, so everyone over 18 is welcome to come and start the week off right. Friday afternoon from 5-7PM SBNZ are going to be having their first annual meeting to introduce everyone to the new board and start the conversation about the pathway ahead for skateboarding in New Zealand. If you have an interest in skating in New Zealand or you want to find a way of participating or helping, please come along. Skateboarding is about community and is a participation activity, it is not a spectator sport. There will be a lot of things to discuss and there will be opportunity to put forward ideas that you feel are helpful for New Zealand skating. The future is looking brighter. Friday evening the 8th, Manky Chops will be holding their annual ARTZILLA as part of the BOWLZILLA Wellington celebrations. The show kicks off from 6pm at Manky Chops Gallery: 15-19 Pirie St corner of Home Street, Te Aro. Manky Chops Deckaid is not just celebrating a decade of Manky Chops this year but it is also about doing right and giving back. The show is the largest skateboard deck art show ever held in New Zealand with all the original artist decks going up for sale with the proceeds going to charity. Bring your friends, bring your money and squeeze into the gallery with everyone else as it is guaranteed to be massive. Excitement is building for the big show – BOWLZILLA Wellington; 9th March at Waitangi Park, Wellington. The competition is on for the next National Champions with divisions for 16 & Under, Women, Pabst Masters 40+ and Pro/Am Open. This is the first year New Zealand skaters can start accruing points from this event for Olympic games qualification. The mix of skaters getting together with their mates for a goodtime and the keen kids up for a craic at the Olympics is going to raise the energy levels this year and make it an awesome show for those gathered round the bowl and to make it more interesting there is a bigger field of international rippers coming too. Yeah Gnar have come on board to ensure it is the largest Equality in Skateboarding event in New Zealand for 2019 with equal cash prize purse in both the Open and Women’s divisions. Everyone is going to be looking to celebrate big on Saturday night and “Dive In” at San Fran on Cuba Street is going to be kicking out the jams for the official BOWLZILLA Wellington after party. Breaking Beats and Pabst Blue Ribbon Beer are joining forces with BOWLZILLA and San Fran to make it one hell of a good time. Ten Pin, Harry Max, Talisman, Martian, Acro, Bamzel, Sub State and MC Tree will be keeping it going from 8 till late. Tickets are available from onpoint.co.nz so grab them before they’re gone. All our friends over 18 are welcome with ID. Sunday is always about family and friends and there is going to be a friendly gathering at Karori vert ramp for everyone to wind down, have a nice Sunday and say their goodbyes until next year. If you like skating then you are friends and family so please come along for a nice Sunday in the park. Posted on February 26, 2019 by chad ford and tagged BOWLZILLA bowlzilla wellington artzilla wellington bowl skating skate art pabst skull candy GoPro Vans Olympic Games skateboarding bowl skatingpool skating. Welcome to BOWLZILLA Gold Coast – one of Australia’s premier international skateboarding festivals. Now in its fourth year, this event celebrates skateboarding with a fun program of competitions, exhibitions, art and music, catering to the thousands of fans and competitors from across Australia. The Palaszczuk Government via Tourism and Events Queensland is proud to support this event which features on the It’s Live! in Queensland calendar. Events like this are important in driving Queensland’s regional economy, promoting our tourism destinations and visitor experiences and supporting local jobs. Best of luck to all those competing, and if you’re visiting the Gold Coast I encourage you to explore more of the region, including our thrilling theme parks, world-famous golden beaches, scenic national parks and amazing local produce. Posted on February 14, 2019 by BOWLZILLA. BOWLZILLA Gold Coast is roaring to the top as the biggest skateboard competition this year for Australia. Setting standards as the benchmark for fun, friendship and full on skating. BOWLZILLA Gold Coast is now the ASF Park Skating National Championships. Yeah Girl is again working with BOWLZILLA to ensure the highest paid Equality-in-Skateboarding event in Australia continues to support the fast-growing women’s skateboard community on its path to the largest international competitive stage. The interest in skating is growing now the Olympics is part of the events landscape and BOWLZILLA Gold Coast as the biggest Park Skating competition in Australia is here to support the locals that want to have a craic but encourage and ensure fun and community stay the main focus. Councillor McDonald and Gold Coast City Council have been visionary in their support of BOWLZILLA Gold Coast and the skateboarding community at large for many years now. 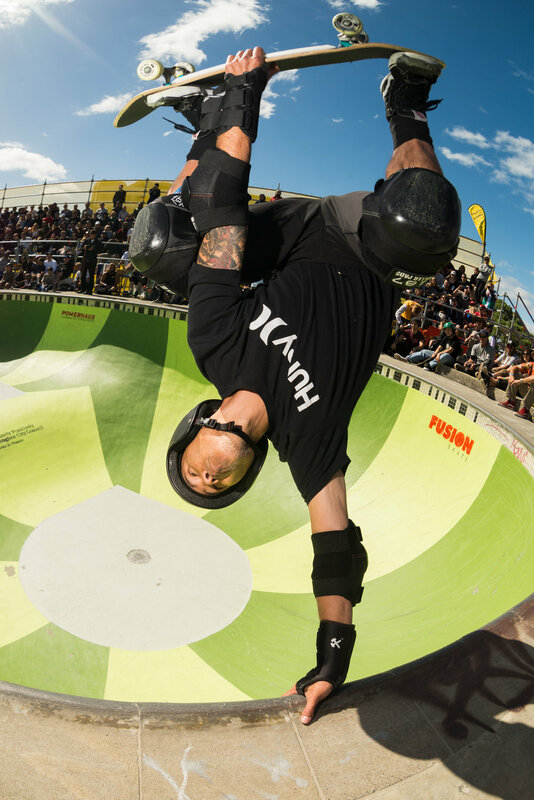 With BOWLZILLA now being elevated to the largest skateboard event of the year in Australia in 2019, their investment is paying dividends. “I have worked closely with the skateboard community for many years and have ensured continuing investment in the Pines Skate Bowl at Elanora because I believed it would provide great benefit to our community and inspire the local youth. Having BOWLZILLA Gold Coast grow into the biggest skateboard event on the National calendar is testament to our city and our fantastic community assets. 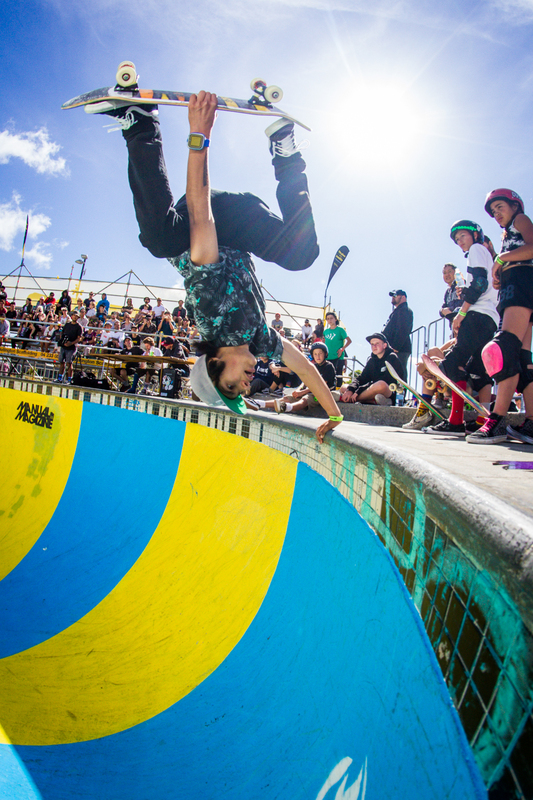 The BOWLZILLA festival brings together Australia and the world’s best skaters and showcases their music and art for the whole of the Gold Coast community and visitors to enjoy.” City of Gold Coast – Councillor Daphne McDonald. Tourism & Events Queensland have come on board to help amplify these fantastic contributions to skateboarding and Queensland. BOWLZILLA features on the It’s Live! in Queensland events calendar. Queensland, just the place to experience Australia’s best live events. “BOWLZILLA would attract skateboard professionals from all over Australia and the world”. Ms Jones said. This year’s BOWLZILLA Gold Coast festival has a full week of fun on and off the board. It will be kicking off with a girl’s learn to ride clinic with Yeah Girl and Gold Coast Skateboard Coaching, there will be nightly gatherings at Beach Burrito Company for art, food and parties, there are several local hosted barbecues at some of the best skateparks in Australia and it is all wrapped around the biggest comp of the year in Australia at Elanora skatepark. “As skaters we all have our own approach to skating and wants from it. The uniting thing is the incredible fun we get out of it and the amazing community it makes us part of. The goal for BOWLZILLA Gold Coast has always been to gather our friends, show off what makes them great, celebrate with our community and invite others in to be part of it all. BOWLZILLA Gold Coast can now be used to help those that want to reach the highest athletic platform in the world but who we are and what we’re about is the gathering, the community and the fun. The opportunity afforded us by our sponsors, Councillor McDonald, Gold Coast City Council and Tourism & Events Queensland means more good times and more new friends. 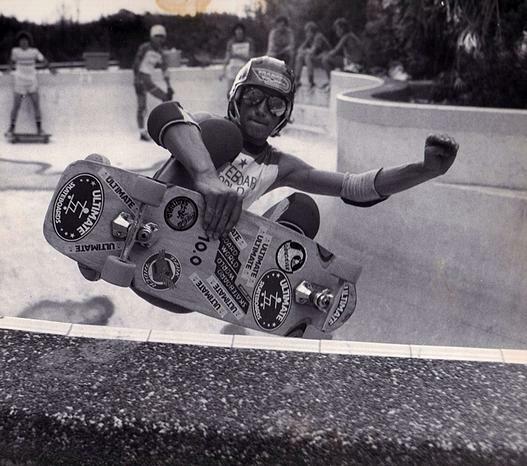 Come skate and celebrate with us.” Chad Ford; BOWLZILLA – Director. There are further announcements coming soon about new sponsors and friends coming to skate with us, so stay tuned. Posted on December 20, 2018 by BOWLZILLA and filed under bowl skating, national championships, park skating and tagged bowlskating BOWLZILLA Bowman Hansen bowl skating Nick Heppenstall Dave Crabb Wellington Gold Coast George Richards good times Keegan Palmer Shaun Boucher Jesse Noonan RJ Barbaro Krysta Ashwell Skateboarding Louis Newman Park skating Pool Skating redbull redbullskate Sean Goff full pipe Yeah Gnar. 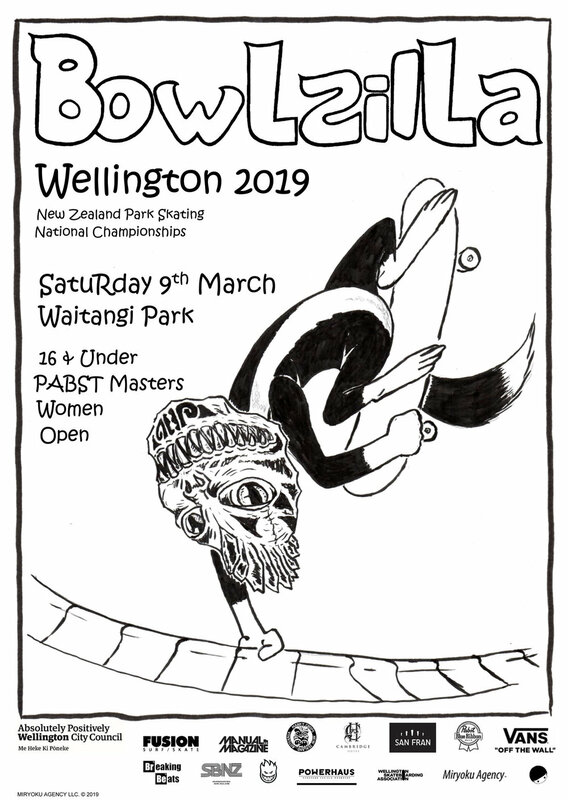 This is the year New Zealand skaters are launched onto the world stage via BOWLZILLA Wellington 2019. Big returns are coming for the skaters of New Zealand with the maturation of their skateboarding Capitol Assets. The road to the Olympic Games for skateboarding begins this year. Qualifying points start accruing the beginning of January for skaters competing in National Titles and other international professional competitions around the world. BOWLZILLA Wellington is the first points awarding Park competition in the world for the year and the beginning of the path. The annual National skateboard festival BOWLZILLA Wellington is returning for its fourth year with the highlight being the all-encompassing New Zealand National Park / Bowl Skating Titles. SBNZ the National Governing body of skateboarding in NZ, sanctions this event as the National Championships for Park / Bowl skating which sees skaters from all around the country and expats flying in to have a craic. The festival includes an art show, some parties and music and an old school ramp jam and barbecue. It is the greatest week of skateboarding in New Zealand and everyone is invited to join in the celebrations. “It is only fitting that Wellington is home to the National Titles of Park Skateboarding – BOWLZILLA Wellington. We are very proud of our creative and healthy community here in Wellington and the promotion of our fantastic lifestyle to the world through this event is brilliant. As skateboarding enters into the Olympics and Wellington becomes a pathway for our local athletes, we look forward to growing this festival and the benefits it has on our community for years to come”. Justin Lester; Mayor of Wellington, New Zealand. There is increasing interest and participation in the competition each year and with the Olympic points opportunity thrown in it is going to make the choice of the next National Champions for 16 & Under, Women, Masters 40+ and Pro/Am Open all the more difficult. With 2018 being the first Equality in Skateboarding event ever held in New Zealand, thanks to Yeah Gnar NZ, this year there is going to be a larger and more inspired international field in the bowl. Wellington City Council, International Skateboarder’s Union, Redhead or Dead Events, Skateboarding New Zealand and Miryoku Agency have joined forces to create this fantastic opportunity for New Zealand skaters. “Whatever lay ahead for skaters with the new Olympic stage we will be here supporting our friends in the skateboard community. We have built a gathering to unite those who love what we do and celebrate the skaters who inspire us to have as much fun as possible on four wheels. Even if you know nothing of skating, we guarantee that time spent at any of the BOWLZILLA Wellington celebrations will turn you into a fan. Come and enjoy the good times with us in Wellington.” BOWLZILLA Director – Chad Ford. BOWLZILLA was born out of likeminded friends in the skateboard community looking for new platforms to promote the extraordinary talents of their friends, talents that run in oversupply within skateboarding but are not often seen in the outside world. BOWLZILLA Wellington is the biggest platform for showcasing all of this amazing talent in skateboarding in New Zealand. There is an open invite for everyone to come and be part of the celebration. The will be more information coming shortly about all the great events happening as part of BOWLZILLA Wellington 2019. Posted on December 20, 2018 by BOWLZILLA and filed under bowl skating, park skating, national championships and tagged bowlzilla BOWLZILLA Wellington Park skating Olympics pool skating Sen Goff Bowman Hansen Yeah Gnar Waitangi New Zealand Lee Ralph World Skate SBNZ Skatebarding New Zealand Shaun Boucher Lester Kasai. Posted on May 7, 2018 by BOWLZILLA and tagged BOWLZILLA full pipe bowl skating pool skating Keegan Palmer Poppy Olson Dave Crabb Sean Goff Jesse Noonan Gold Coast Keiran Wooley Nick Heppenstall. Posted on May 7, 2018 by BOWLZILLA and tagged BOWLZILLA Wellington bowl skating pool skating Sean Goff Shaun Boucher Lester Kasai Bowman Hansen RJ Barbaro Dave Crabb Krysta Ashwell good times. BOWLZILLA Gold Coast injected some well needed heat into the Australian skateboarding world today with the largest Equality In Skateboarding prize purse in its history. 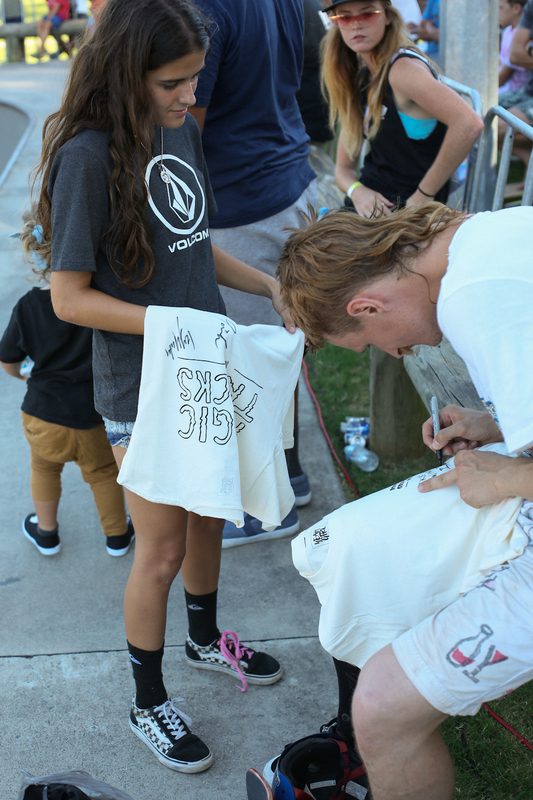 BOWLZILLA Gold Coast had great partners this year with Yeah Girl and Surf Dive ‘n Ski, that helped push skateboarding forward with a big statement in fairness for all in skateboarding. What is already an exciting event managed to ignite with this goodwill which saw the largest participation so far with the most enthusiastic competitive field Australia has seen in a long time. This enthusiasm is made possible because BOWLZILLA Gold Coast is a skater owned and run event, it is of its community for its community. Everyone is stoked to be part of something that supports their friends and it is really obvious in the energy and fun levels on display all week. BOWLZILLA Gold Coast is the largest park / bowl competition in Australia and the scoring is based around use of the whole park in each run with the best run counting. The only way to move ahead to the finals was by using the whole park in your runs. The skaters that stuck to this stood out above all the others with the flow and style this approach gives their skating. Women’s skateboarding is going through a renaissance globally which was clearly evident today at BOWLZILLA Gold Coast. No longer content to wait for the skateboard industry and the world at large to recognise them, they are out there blazing their own path. Shari Lawson who was the first women to ever judge a professional skateboard competition last year at BOWLZILLA Gold Coast was back again this year on the panel to oversee the largest ever Equality In Skateboarding cash prize purse in Australian history. BOWLZILLA Gold Coast is proud to be working with the women’s scene to amplify their voice and ensure they control their platform. The first of many big steps forward. The week’s festivities kicked off with Yeah Girl and Beach Burrito Company hosting the opening party on Thursday night at Coolangatta, then on Friday night the locals shared their hospitality with the many visitors from Malaysia, UK, New Zealand, Brazil, Finland, USA and beyond with a session at Salk Oval skatepark. 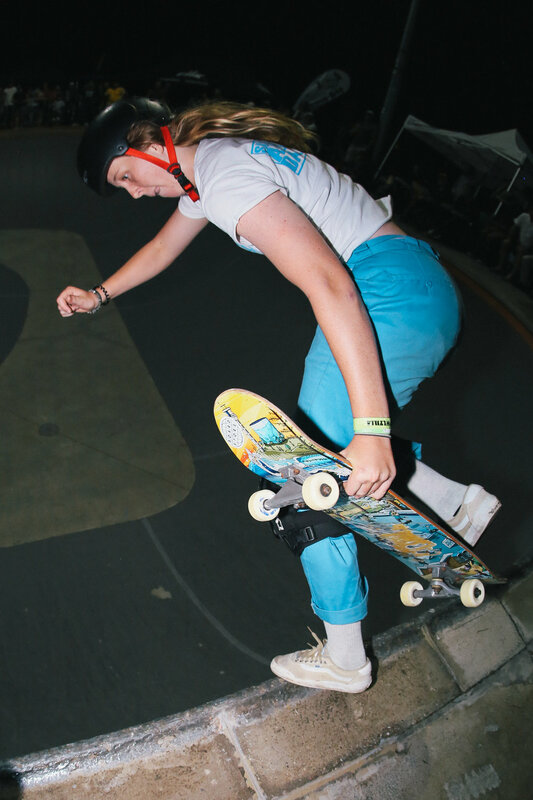 The competition ran Saturday at Elanora skatepark and on Saturday night it all wrapped up with Dive In hosted by Yeah Girl and Surf Dive ‘n Ski at Beach Burrito Company in Coolangatta. Another great week to finish off the summer season on the Gold Coast. Bring on 2019 BOWLZILLA Gold Coast. BOWLZILLA Gold Coast has long term plans to grow every year to increase the fun potential for Australian skating by using a competition as the excuse to gather the widest range of generations of skaters for good times and great skating. BOWLZILLA Gold Coast invites all the skaters to come and be part and have a say in how they want their fun. City of Gold Coast Councillor Daphne McDonald proudly supported the BOWLZILLA Gold Coast events for a third year running. She was instrumental in the funding of the skatepark, getting the lights in, building out the site to better enable events to happen and being a fantastic advocate for skateboarding in general. Everyone at the event is grateful for her ongoing support. 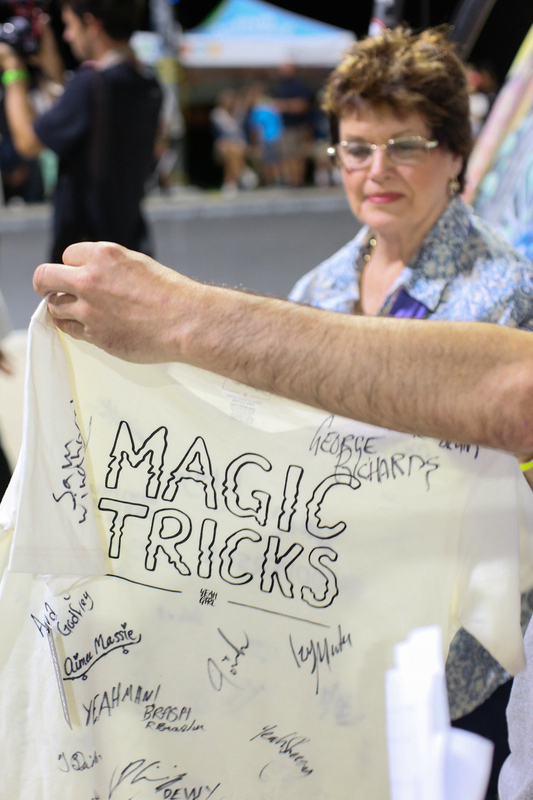 This year all the competitors wanted to give her a special thank you and all signed a unique piece of memorabilia for her in appreciation. “This year has been a long time coming and we at BOWLZILLA are so proud to be part of it. Women make up over 50% of Australia and the World’s population and always get considerably less. To do something that helps in some small way move everyone forward to an equal footing in the lifestyle we love so much fills us with stoke. Everyone in skateboarding won today with what was achieved. Thanks to Councillor Daphne McDonald’s very generous ongoing support and belief in the skateboarding community we have been able to build a platform that made today possible. Gold Coast City Council, Tourism and Events Queensland, Goliath, Fiik, Gold Coast Skateboard Coaching, Beach Burrito Company, Australian Skateboarding Federation, International Skateboarder’s Union all assisted and Yeah Girl and Surf Dive ‘n Ski gave it the extra nudge to really make the moment so awesome. Thank you everyone and looking forward to skating with you all again next year at BOWLZILLA Gold Coast 2019.” Chad Ford – Director of BOWLZILLA and Miryoku Agency LLC. BOWLZILLA Gold Coast would not be possible without the incredible support of its sponsors and supporters, a huge thank you to; Gold Coast City Council, Beach Burrito Company, Protec, Goliath Distribution, Fiik Skateboards, Gold Coast Skateboard Coaching, Yeah Girl, ISU, Darkside, Dickies, ASF, Redhead Or Dead Events and Miryoku Agency. Posted on March 17, 2018 by BOWLZILLA. Posted on March 16, 2018 by BOWLZILLA. 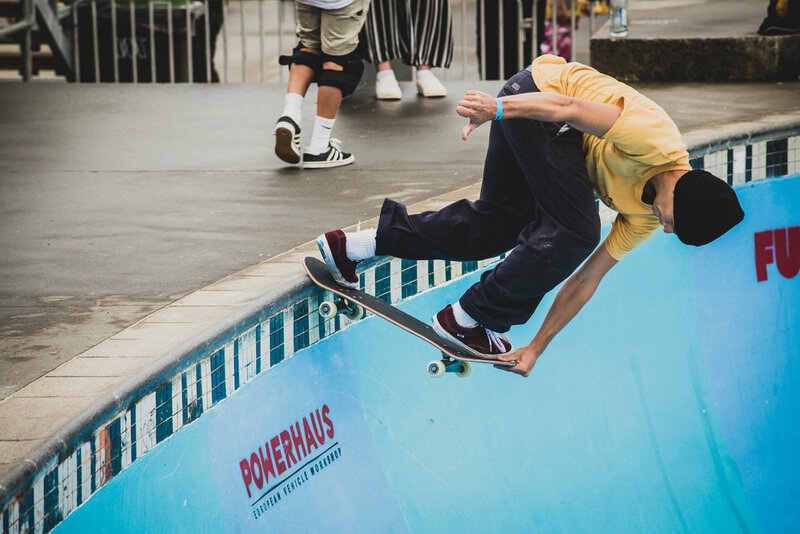 Wellington City Council, International Skateboarder’s Union, Redhead or Dead Events, Skateboarding New Zealand and Miryoku Agency staged the New Zealand 2018 National Titles Park / Bowl Skateboarding Championships with BOWLZILLA Wellington in the Nation’s Capital. SBNZ and ISU continued the New Zealand National Skateboarding Park / Bowl competition series. It all culminated on the weekend with BOWLZILLA Wellington. Wellington once again was the greatest stage for skateboarders in the nation. Wellington always surprises – ALWAYS! Terrible weather all week. The day started overcast and freezing. It felt like there was something changing as the day moved forward though. You could see it in the skating and hear it in the crowd. The weather changed for the better and the whole event just went crazy. Then during all of that, completely out of the blue in the middle of the comp, Lydia and Daroll Clark from Yeah Gnar came up and gave cash to equalise the prize purse with the Women's division to the Open division. They contributed $5350 and asked for nothing in return. They just want to support women and see them equitably treated. What was already an amazing day in New Zealand skate history just became the best. Not only the first but a very large Equality in Skateboarding moment in New Zealand. It would be safe to say today was the proudest day in New Zealand skateboarding history. The National Champions crowned were; Women - Krysta Ashwell, 16 & Under - Soul Kropelnicki, Masters – Ramon Thackwell, Open – Shaun Boucher. With Competition title going to Australian RJ Barbaro, for the third year straight. R.J and Shaun were both successful in maintaining their titles from 2016 and 2017, what an amazing feat that is. With New Zealand having the representative competitor for all of Oceania at last year’s World Championships; Bowman Hansen, there is a lot of interest and excitement building in the local talent. BOWLZILLA Wellington as the National Titles is the greatest platform for local riders and their stepping stone onto the world stage. The skating at this year’s event shows there is a bright future ahead for New Zealand skateboarding. There was NZ$8,000 in prize money and that ended up growing to NZ$13,350 distributed amongst the Women, Open and Masters divisions. There was also $2000 worth of prizes, donated by; Fusion Surf / Skate, Vans, Manual Magazine and Dickies, for the 16 & Under and Women’s divisions, which were distributed amongst all the competitors. “There could be no better place for the National Titles of Park skating in New Zealand than the Nation’s Capital – Wellington. The partnership between BOWLZILLA Wellington, SBNZ, ISU, Miryoku Agency, Redhead Or Dead Events and all the sponsors; Irrom, Spitfire, Fusion, The Cambridge Hotel, Manual Magazine and Manky Chops is doing great things for New Zealand skateboarding. The talent we have coming up and the amazing riders we already have on the world stage backs up what we are doing at SBNZ. There are great times ahead for New Zealand skateboarders and we look forward to assisting them every way we can” Jesse Peters – Director, SBNZ. 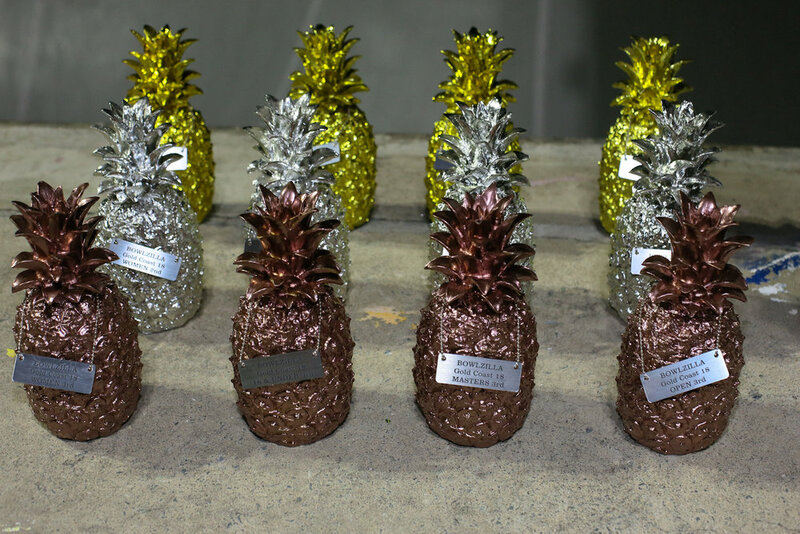 It was another great year for BOWLZILLA Wellington with the festival hosting; ARTZILLA – art show, which was produced by Manky Chops, Fusion Surf / Skate – welcome party, the competition and wrapping it up with the Dive In - party at Basque supported by Tuatara. Every single part of it lived up to Wellington’s reputation as the best place to be in New Zealand. "Three years in and we’re just getting started. Every year we see the local talent get better and more skaters drop in. The level of skating and interest in them is growing noticeably each year. There are some exciting times ahead for New Zealand skating that we are looking forward to sharing with everyone but right now we just want to celebrate the epicness that was BOWLZILLA Wellington 2018 and thank all of our supporters, sponsors, fans, the skaters and especially Yeah Gnar!” Chad Ford – Director, BOWLZILLA Wellington. Without the very generous support of the sponsors none of BOWLZILLA Wellington would be possible, so a huge thank you goes to; Wellington City Council, Skateboarding New Zealand, International Skateboarder’s Union, Fusion Surf/Skate, Manual Magazine, Manky Chops, Yeah Gnar, Powerhaus European Vehicle Workshop, Basque, The Cambridge Hotel, the generous prizes from Dickies and Vans and the organisational skills of Redhead or Dead Events and Miryoku Agency. With ongoing support like this the opportunities for New Zealand skating are awesome. We would like to acknowledge and thank all of the international attending skaters for their support of the event and skateboarding in New Zealand; Louis Newman - Australia (16 & Under), Oksana Lines - USA (Women), Lester Kasai - USA (Masters), Sean Goff - UK (Masters), George Richards – Australia (Open), Brodie Jarret – Australia (Open) Sox – Wales 9 Open), Rob Ayton – UK (Open) and of course R.J. Barbaro – Australia (Open). Posted on March 9, 2018 by chad ford. Wellington weather can be cruel so times may change to when we can get the skating done. We will get through it all on the day though. Posted on March 7, 2018 by BOWLZILLA. Yeah Girl and Surf Dive ‘n Ski along with International Skateboarder’s Union, Australian Skateboarding Federation and Miryoku Agency are breaking boundaries and setting standards this year at BOWLZILLA Gold Coast. Yeah Girl and Surf Dive ‘n Ski have partnered up to assist BOWLZILLA in creating the highest paid Equality-in-Skateboarding event in Australian history. Australian Skatepark League launched 2017 with equal pay for the first time in Australia in both the Open and Women’s divisions and in 2018 BOWLZILLA Gold Coast gratefully acknowledges and raises that bar. As the international women’s skateboarding community grows stronger and blazes their own path, BOWLZILLA is proud to do its part in supporting them. “To be able to work with BOWLZILLA and help to raise funds for an equal prize purse is an honour. It’s something that the women’s skate community has been constantly pushing for and it's great to finally have events like BOWLZILLA, that support the push for equality and recognise the talent and dedication in women's skateboarding." Yeah Girl – Director; Sarah Huston. The foundation all of this is built on is the incredible support and recognition of skateboarding by City of Gold Coast. CoGC has built more skateparks per capita than any other city in Australia which has provided the best stage to produce an event like BOWLZILLA Gold Coast. This year Tourism and Events Queensland are facilitating the opportunity to promote and boast about that epic achievement and the fantastic community it represents. The Queensland Government, via Tourism and Events Queensland, is proud to support BOWLZILLA which features on the It’s Live! in Queensland events calendar. Queensland, just the place to experience Australia’s best live events. BOWLZILLA Gold Coast is not just a skateboard competition, it is a festival of skateboarding. As part of the festival this year there is; a girl’s learn to ride clinic with Yeah Girl, Gold Coast Skateboard Coaching and Surf Dive ‘n Ski, art shows, food and parties with Beach Burrito Company, Yeah Girl and Surf Dive ‘n Ski and loads of gathering and sessions at the many amazing skateparks the Gold Coast has to offer. City of Gold Coast Councillor Daphne McDonald has given huge support to skateboarding on the Gold Coast through; funding facilities, upgrading and maintaining those facilities so they can support amazing events like BOWLZILLA Gold Coast and even supporting those events that promote the best of the Gold Coast community both near and far. “I am proud to partner with BOWLZILLA for the third consecutive year and sponsor the largest meet for skaters in Queensland at Pines Skate Bowl at Elanora. The growth of BOWLZILLA is really exciting as the Gold Coast sets the stage for this first class athletic and creative international event. 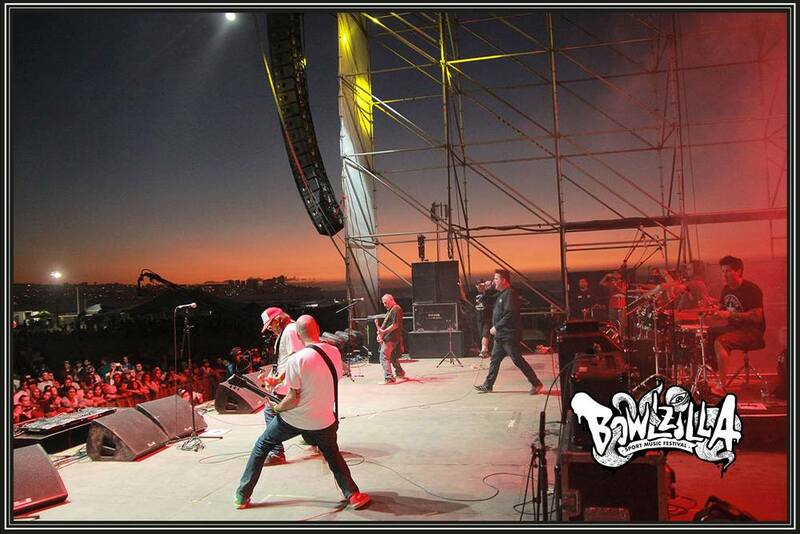 BOWLZILLA is a festival bringing together, world champion and local skaters , music and art. An event for the whole of the Gold Coast community to enjoy.” City of Gold Coast – Councillor Daphne McDonald. More and more riders from around the world are being drawn to this fast paced, exciting and fun part of skateboarding. With the growth in public skateparks around the world which means easier and less restricted access to this type of skating plus how much fun it is, it is no wonder it is the fastest growing part of the community. “BOWLZILLA Gold Coast is the biggest gathering of skateboard generations in Australia at a by skaters for skaters event. We are about our community 100%. The incredible support we receive from GCCC, TEQ, Yeah Girl x Surf Dive ‘n Ski, ASF and everyone else in supporting skaters as they want to be supported and represented is something we work very hard to honour year in year out. What we are achieving this year is a huge testament to our communities strength. Equality in Skateboarding has taken another step forward. ” Chad Ford; BOWLZILLA – Director. Posted on February 12, 2018 by BOWLZILLA. New Zealand skating is put on the world stage at BOWLZILLA Wellington 2018. Wellington City Council, International Skateboarder’s Union, Redhead or Dead Events, Skateboarding New Zealand and Miryoku Agency are all combining forces to get Wellington shaking. BOWLZILLA Wellington is the all-encompassing New Zealand National Bowl / Park Skating Titles. SBNZ the National Governing body of skateboarding in NZ, sanctions this event as the National competition series final. With such great honour, all stops are pulled out to ensure it is the biggest celebration of skateboarding and its culture all year in New Zealand. There is excitement building for this third year of BOWLZILLA Wellington; 10th March at Waitangi Park, Wellington. The competition is on for the next National Champions with divisions for 16 & Under, Women, Masters 40+ and Pro/Am Open. 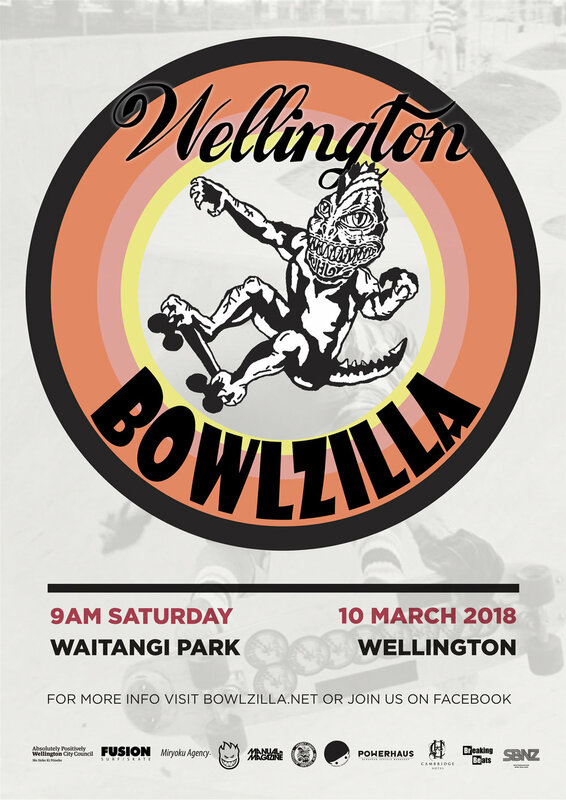 With; art shows, parties, music, gatherings, barbecues, good times and the competition itself, BOWLZILLA Wellington is going to be the greatest weekend of New Zealand skating in 2018. With BOWLZILLA Wellington taking on such an important role in the national landscape and the partnership with national governing body SBNZ and skateboarding now an official Olympic sport, there is greater interest and support coming from national government agencies and the public at large. When you add in that the Oceania representative rider Bowman Hansen at this year’s Park World Champs comes from Taupo, New Zealand, there are big things ahead for New Zealand skateboarding and BOWLZILLA Wellington on the 10th of March 2018 is the biggest stage for it. To create fantastic opportunities like these for skateboarders in New Zealand you need great support, that is provided by; Wellington City Council, SBNZ, International Skateboarder’s Union, Fusion Surf/Skate, Manual Magazine, Manky Chops, and the organisational skills of Redhead or Dead Events and Miryoku Agency. They have all pooled together to build events that help nurture scenes, create opportunity for local skaters and create amazing moments to celebrate all that make New Zealand skateboarding great with art, music and the competitions. 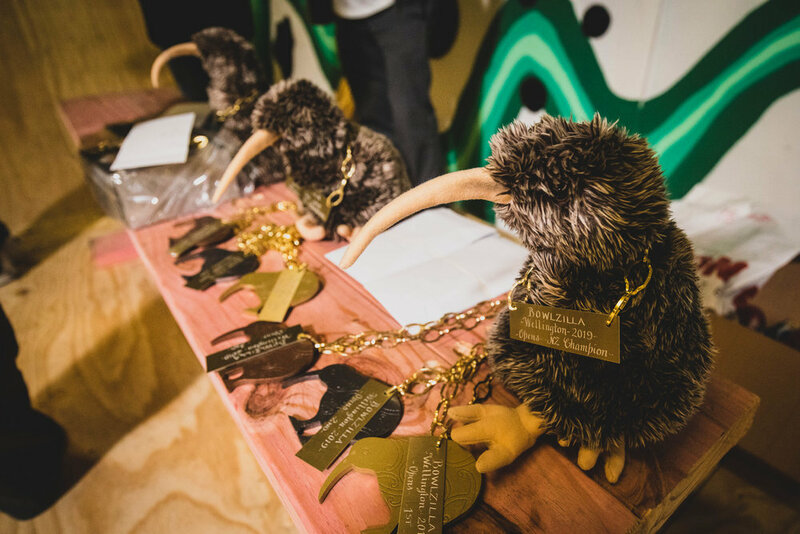 “Art, music, parties, friends and the best skating of the year all mixed together in the funnest town in New Zealand. BOWLZILLA Wellington is going to be the biggest celebration of our friends and their talent for 2018 in New Zealand. 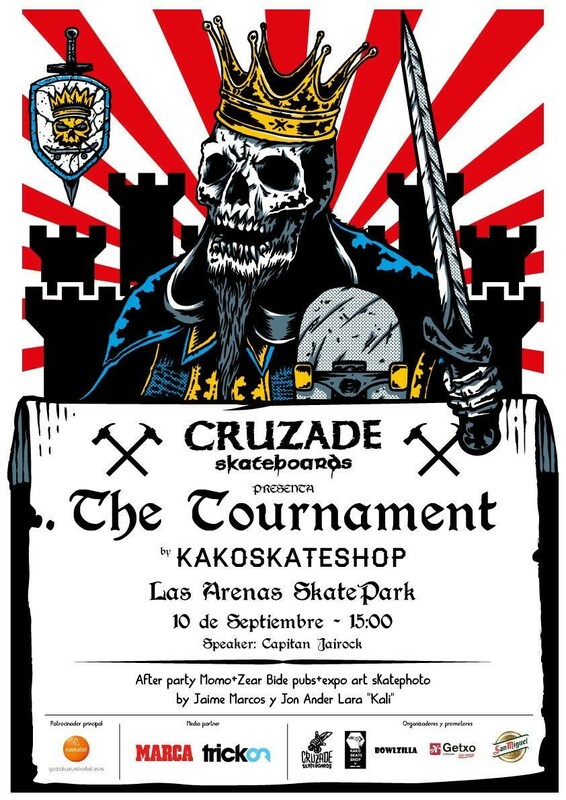 We invite everyone to come and be part of it.” BOWLZILLA Director – Chad Ford. BOWLZILLA was born out of likeminded friends in the skateboard community looking for new platforms to promote their friends extraordinary talents, talents that run in oversupply within skateboarding but not are often seen in the outside world. BOWLZILLA Wellington is the biggest platform for showcasing all of this amazing talent in skateboarding in New Zealand. There is an open invite for everyone to come and be part of the celebration. The will be more information coming shortly about all the great events happening as part of BOWLZILLA Wellington 2018. Posted on January 31, 2018 by BOWLZILLA and tagged Sean Goff Lester Kasai Shaun Boucher Bowman Hansen Louis Newman Lee Raplh Fusion Surf / Skate Spitfire Irrom George Richards Willy Lara Patrick Ryan Wellington Skateboarding Pool Skating Bowl Skating. BOWLZILLA Gold Coast dodged all the weather and managed a perfect blue sky day and amazing competition for the second year running. BOWLZILLA Gold Coast built upon last year’s successes to give Australian skating its own fun skater owned and run event. It was an awesome week to celebrate all that makes skateboarding great with art, music and the competition. The weather looked terrible all week with some even predicting catastrophic conditions for the Saturday. Thanks to some good connections (thanks Sarah) the sky turned blue and the competition ran with Saturday remaining mainly hot and sunny. Given only half the competition could be held in Wellington the week before it was decided on the day to amend the schedule and push through as quickly as possible to ensure all skaters got their fair share. New BOWLZILLA Gold Coast champions were chosen across 3 of 4 divisions. As it is a park / bowl competition the scoring is based around use of the whole park in each run with the best run counting. The riders that embraced this approach best by using the whole bowl in their best run ended up on the podium. The women’s skateboarding scene is going from strength to strength at the moment and BOWLZILLA wants to do everything it can to support and encourage this. For the first time in an Australian major skateboard competition, a female judge was on the panel for the whole event. Shari Lawson did an amazing job along with her fellow panellists Bevin Newton and Brodie Jarret. Shari wasn’t chosen because of a quota but because it is long overdue and she deserved the job. This will be a permanent position at BOWLZILLA Gold Coast from here on. The week’s festivities kicked off with Beach Burrito Company hosting the opening party on Thursday night at Coolangatta, then on Friday night Yeah Girl did the Gold Coast premiere of the international all women’s skateboard film “Quit Your Day Job” which opened to thunderous applause and they were kept company on the night by Fiik Skateboards and their film premiere of “Steady Lurking” showcasing the best of local talent and humour at Warehouse No.5. The competition ran Saturday at Elanora skatepark and on Saturday night it all wrapped up with Dive In at Beach Burrito Company in Coolangatta. Another great week to finish off the summer season on the Gold Coast. 2018 BOWLZILLA Gold Coast is going to be amazing, given what has been done so far. City of Gold Coast Councillor Daphne McDonald proudly supported the BOWLZILLA Gold Coast events for a second year running. She was instrumental in the funding of the skatepark, getting the lights in, building out the site to better enable events to happen and being a fantastic advocate for skateboarding in general. Everyone at the event is grateful for her ongoing support. “When you mix together a great local scene with a deep history, awesome skateparks, the most supportive council in Australia for skating, a community that encourages board sports because they believe in the benefits of it for the community as a whole rather than as a revenue stream, incredibly talented and friendly local skaters and sponsors that are involved because it is their community, then you get great things happening. We’re so fortunate to be able to be part of all of this. We will work hard every year to make BOWLZILLA Gold Coast the best it can be for all of them to show our appreciation.” Chad Ford – Director of BOWLZILLA and Miryoku Agency LLC. BOWLZILLA Gold Coast is working to develop gatherings that use championship competitions to get everyone together to share and skate and grow and enjoy skating. With the TV show being distributed by IMG to a potential single view audience of over 640,000,000 viewers it is a great way for the world to see how talented our friends are and why they are worth supporting with great events, skateparks and sponsorship. BOWLZILLA Gold Coast is growing each year with increased benefit for the locals and all divisions will expand with the world’s top talent while encouraging and benefiting Australia’s best. CR McDonald said; “We have worked hard to support the growth of the exciting and healthy activity of skateboarding on the Gold Coast and it was fantastic that the Pines Skate bowl at Elanora, the first open full pipe in Australia, was chosen to hold BOWLZILLA Gold Coast event. There are increasing opportunities for skateboarding and the Gold Coast is poised to be the hub of it all, especially with skateboarding now recognised as an official Olympic Games sport for Tokyo 2020”. Posted on March 27, 2017 by BOWLZILLA. Posted on March 17, 2017 by BOWLZILLA. 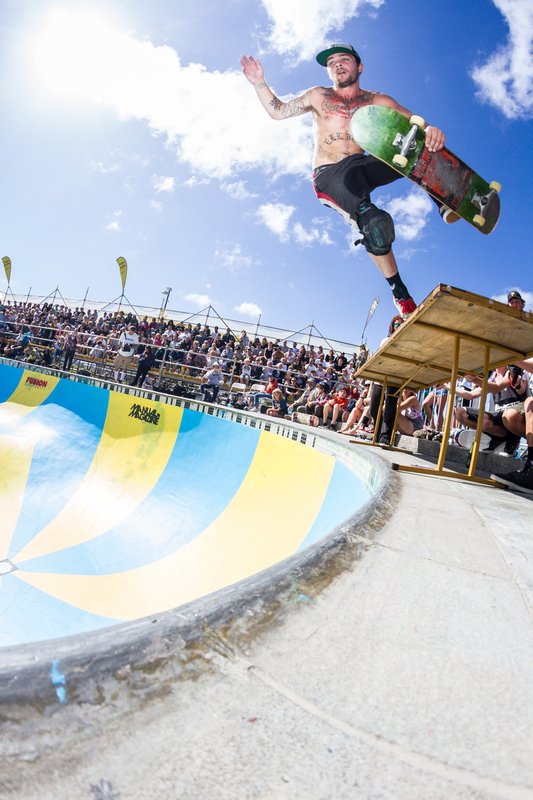 Wellington City Council, International Skateboarder’s Union, Redhead or Dead Events, Skateboarding New Zealand and Miryoku Agency staged the New Zealand 2017 Park / Bowl Skateboarding Championships with BOWLZILLA Wellington in the Nation’s Capital. SBNZ and ISU combined to establish the first ever New Zealand National Skateboarding Park / Bowl competition series. It all culminated on the weekend with BOWLZILLA Wellington. Wellington maintained its reputation for inconvenient weather for the entire weekend but luckily the Open and Masters divisions could be held and winners chosen. The National Champions crowned were; Masters 40+; Leigh McKenzie, Open; Shaun Boucher. With Competition title going to Australian RJ Barbaro. R.J and Shaun were both successful in maintaining their titles from 2016. The weather made it impossible in the end to run the Women’s and 16 & Under divisions. The fast-developing talent in both divisions left everyone disappointed they did not get to see and support these amazing skaters. SBNZ will be integrating the 16 & Under and Women’s National Championship 2017 ranking into a future event this year. There was NZ$15,000 in prize money distributed amongst the Open and Masters divisions. There was also$2000 worth of prizes, donated by; Fusion Surf / Skate, Vans and Dickies, for the 16 & Under and Women’s divisions, which were equally distributed amongst all the competitors after the wash out. “Park / Bowl skating is clearly on the rise in New Zealand as was evidenced by the new talent entering our competitions over summer and the rise in skill level of the current skaters. The new series we established here at SBNZ is a real boost for the local scene and is bringing out more riders from near and far. We have interest from a lot of organisations to help us find ways of funding and supporting skateboarding now and well into the future. With our involvement in assisting communities develop and build better skateparks, working with promoters to establish competitions for local talent to develop and providing a community and voice for New Zealand skaters, the future is looking great. Having BOWLZILLA Wellington be the series final gives us a great chance to cap each year and we look forward to working with them for many years to come.” Jesse Peters – Director, SBNZ. Even with the challenging weather BOWLZILLA Wellington was a Capital success with the festival hosting; ARTZILLA – art show, which was produced by Manky Chops, Fusion Surf / Skate – welcome barbecue, the competition and wrapping it up with the Dive In - party at San Fran with the SUB:BASS crew raising the roof for the final celebration. "This year BOWLZILLA Wellington was a real game changer for us, we managed to triple the prize purse, saw an increase in international competitors, more friends and fans at the festival events, far more support from a wider group of sponsors and the growing talent of the skaters. It means we have a long future in Wellington. Being able to integrate this all in with SBNZ so we can crown the National Championships for New Zealand makes it that little bit extra special for us. Thank you one and all for everything you did to contribute to such an amazing but wet week.” Chad Ford – Director, BOWLZILLA Wellington. Without the very generous support of the sponsors none of BOWLZILLA Wellington would be possible, so a huge thank you goes to; Wellington City Council, Skateboarding New Zealand, International Skateboarder’s Union, Coffee Supreme, Fusion Surf/Skate, Manual Magazine, Manky Chops, Powerhaus European Vehicle Workshop, San Fran, The Cambridge Hotel, the generous prizes from Dickies and Vans and the organisational skills of Redhead or Dead Events and Miryoku Agency. With ongoing support like this the opportunities for New Zealand skating are awesome. We would like to acknowledge and thank all of the international attending skaters for their support of the event and skateboarding in New Zealand; Louis Newman - Australia (16 & Under), Sari Simpson - Australia (Women), Nic Couscouris - USA (Masters), Sean Goff - UK (Masters), Willy Lara – USA (Open), Patrick Ryan - USA (Open). We'll get it next year! Stay tuned for announcements about BOWLZILLA Wellington 2018. Posted on March 13, 2017 by BOWLZILLA. Click here to view the webcast. Check times above. Posted on March 10, 2017 by BOWLZILLA. 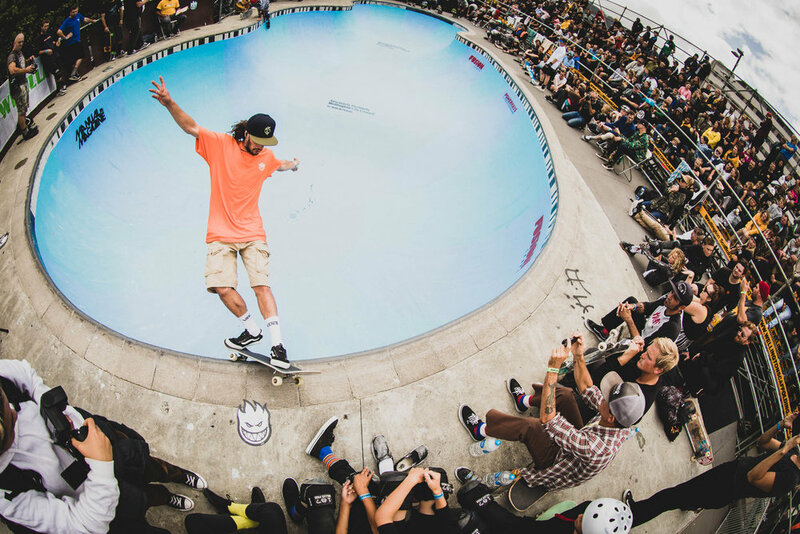 BOWLZILLA Gold Coast is rolling into its second year and getting everyone together for the largest skate gathering by skaters for skaters in Australia. BOWLZILLA Gold Coast is building on last year’s success to ensure that the future for Australian skating is fun and owned by skaters. Making fun times for everyone to celebrate all that makes skateboarding great with art, music and the competition. City of Gold Coast Councillor Daphne McDonald is proudly supporting the BOWLZILLA Gold Coast events which is running concurrently beside other great events on the Gold Coast. It all starts with the Tic Taco skate art exhibition at Beach Burrito Company Coolangatta on Thursday 16th March, Friday 17th the famous Gold Coast hospitality will be shared with all our well-travelled friends with a barbecue and good times, the competition itself is at Elanora skatepark on Saturday 18th March and Dive In; the official BOWLZILLA Gold Coast after party is on that night to wrap of the festivities. Yeah Girl will be helping curate and stoke everyone. Park and transition skating is being talked about as the fastest growing discipline in skating globally. This is because of how fun it is and the proliferation of so many new and amazing skateparks around the world. The flow and speed of it is awesome to watch and in our opinion definitely the funnest thing on four wheels to do. Its uniqueness has shaped skateboarding since the 70s with that initial shockwave of the Dog Town and Z Boys. BOWLZILLA Gold Coast takes the freeform approach of our forefathers to build a platform that is less about the strict structure of competition and more about the opportunity of gathering all our friends from far and wide and encouraging their weird and amazing approaches. BOWLZILLA Gold Coast is working to develop gatherings that use championship gatherings to get everyone together to share and skate and grow and enjoy skating. BOWLZILLA Gold Coast's top riders will be promoted globally through the BOWLZILLA media platform of social media and television to ensure they are internationally celebrated. 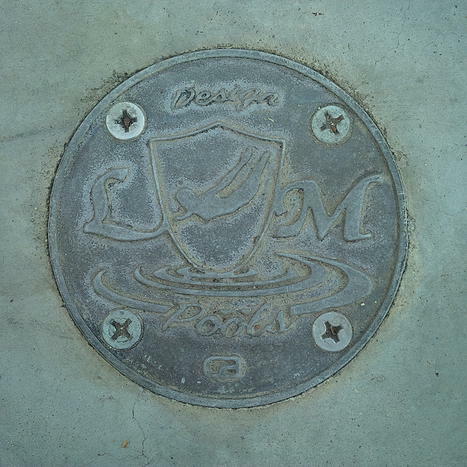 With the TV show being distributed by IMG to over 640,000,000 homes, it is a great way for the world to see how talented our friends are and why they are worth supporting with great events, skateparks and sponsorship. BOWLZILLA Gold Coast is growing each year with increased benefit for the locals and all divisions will expand with the world’s top talent while encouraging and benefiting Australia’s best. “Gold Coast City Council have proven themselves to be the greatest supporters of skating in Australia by providing the most skateparks per capita in the nation and encouraging the growth of the industry and lifestyle. We could not be in a better place to grow Australian skateboarding. The future is brighter because of them and we’re glad to be a part of it”. Chad Ford; BOWLZILLA director. 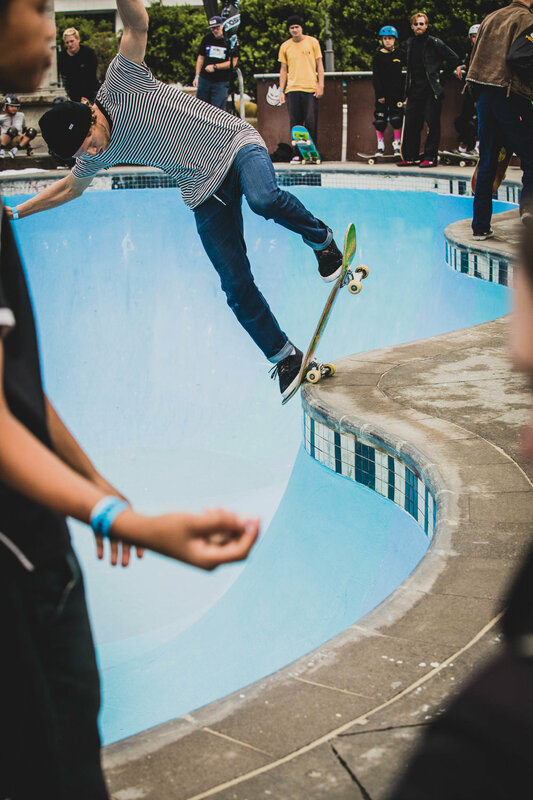 CR McDonald said; “We have worked hard to support the growth of the exciting and healthy activity of skateboarding on the Gold Coast and it was fantastic that the Pines Skate bowl at Elanora, the first open full pipe in Australia, was chosen to hold the first BOWLZILLA Gold Coast event. There are increasing opportunities for skateboarding and the Gold Coast is poised to be the hub of it all, especially with skateboarding now recognised as an official Olympic Games sport for Tokyo 2020”. Posted on January 30, 2017 by BOWLZILLA. Wellington City Council, International Skateboarder’s Union, Redhead or Dead Events, Skateboarding New Zealand and Miryoku Agency are building New Zealand skating with BOWLZILLA Wellington in the Nation’s Capital. BOWLZILLA Wellington launched the first all-encompassing New Zealand National Park Skating Titles in 2016. The first National Champions crowned were; 16 & Under - Rico Henare, Women - Rhya Henare, Masters 40+ - Stephen Crump, Open - Shaun Boucher. With Competition title going to Australian RJ Barbarro. There is excitement building for the second year which is on; 11th March at Waitangi Park, Wellington. The competition is on for the next National Champions with divisions for 16 & Under, Women, Masters 40+ and Pro/Am Open. BOWLZILLA Wellington is the rallying point to get everyone together to celebrate all the great parts of skateboard culture with; art shows, parties, music, gatherings and good times. 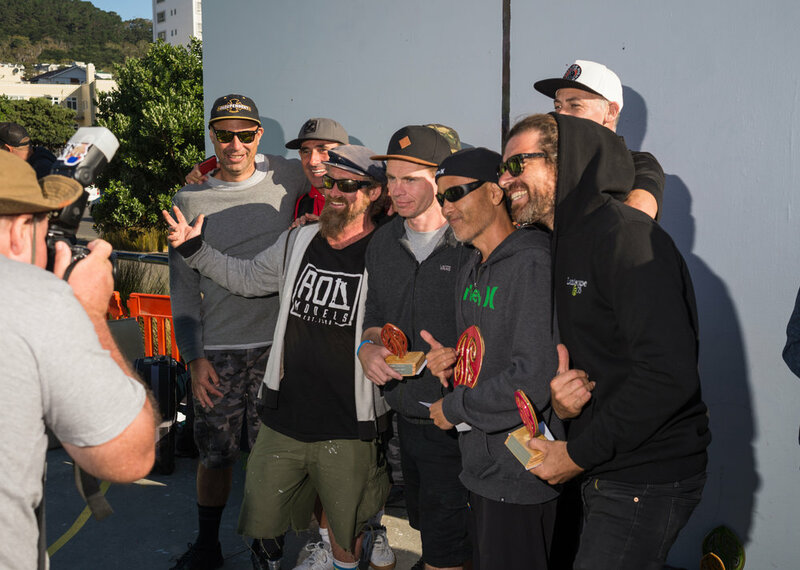 There's a prize pool over NZ$15,000, making it the richest skate comp in New Zealand. This year BOWLZILLA Wellington titles take on a more important role in the national landscape. 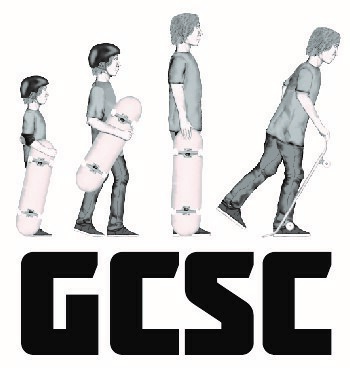 With the formation of the new national governing body; Skateboarding New Zealand, greater interest coming from national government agencies, we are on the precipice of a big new future for skateboarding in New Zealand. BOWLZILLA Wellington is the official Skateboarding New Zealand National Park Skating Titles. All park and bowl competitions in New Zealand now lead to the finals in Wellington on 11th March 2017. None of this is possible without the incredible support of sponsors and groups such as; Wellington City Council, Skateboarding New Zealand, International Skateboarder’s Union, Coffee Supreme, Fusion Surf/Skate, Manual Magazine, Manky Chops, Powerhaus European Vehicle Workshop, San FRan and the organisational skills of Redhead or Dead Events and Miryoku Agency. They have all pooled together to build events that help nurture scenes, create opportunity for local skaters and create amazing moments to celebrate all that make New Zealand skateboarding great with art, music and the competitions. 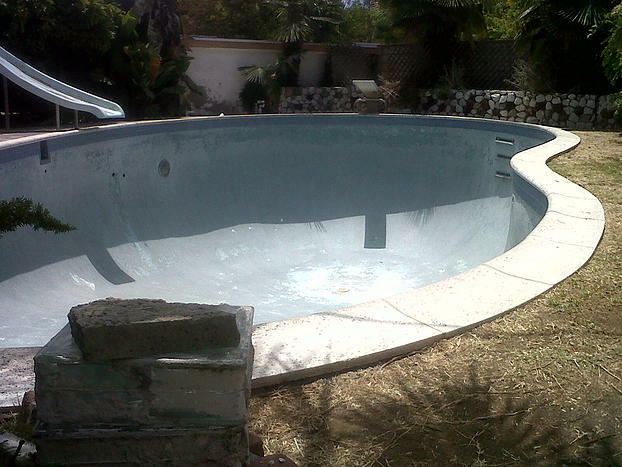 “BOWLZILLA was formed and is 100% conceived and run by skaters. To be able to get so many companies and agencies willing to support such a unique organisation with our focus based solely on getting our friends together to have a good time doing what we love and promote their talents to the world is incredible and not something we take for granted. That is why you see so many more smiles at BOWLZILLA. The stoke level is high! 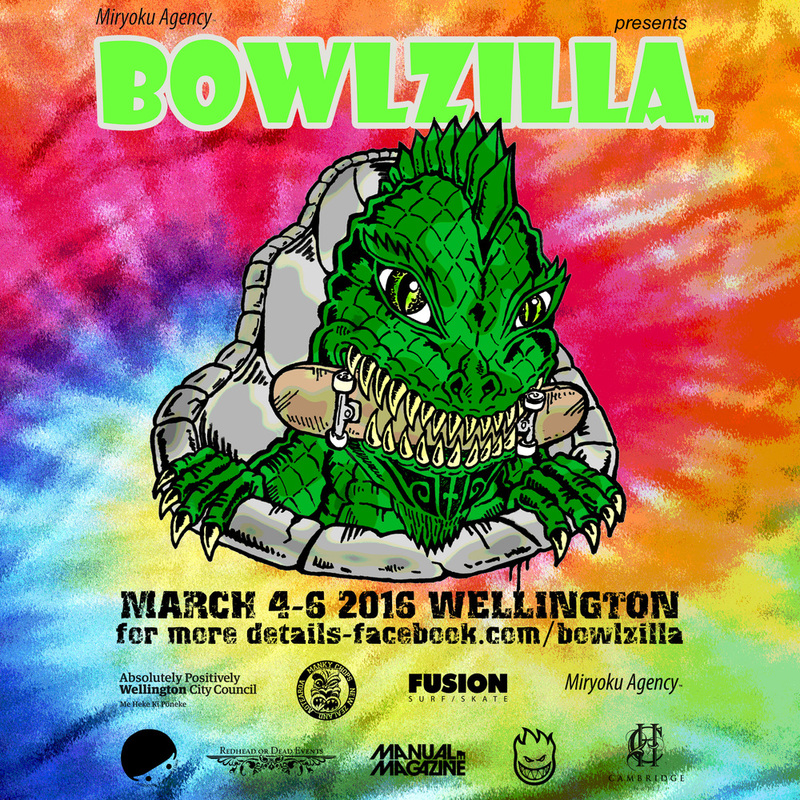 You are all welcome to come and be part of it all in Wellington.” BOWLZILLA Director – Chad Ford. BOWLZILLA started in Getxo, Spain, in September 2015 and has since built the first proper concrete bowl in Chile and run the first international professional competition in Chile, created a new format and platform for Australian skaters with BOWLZILLA Gold Coast and established the first National bowl skating titles in Wellington, New Zealand. There will be more information coming shortly about all the great events happening as part of BOWLZILLA Wellington 2017. Posted on January 19, 2017 by BOWLZILLA.